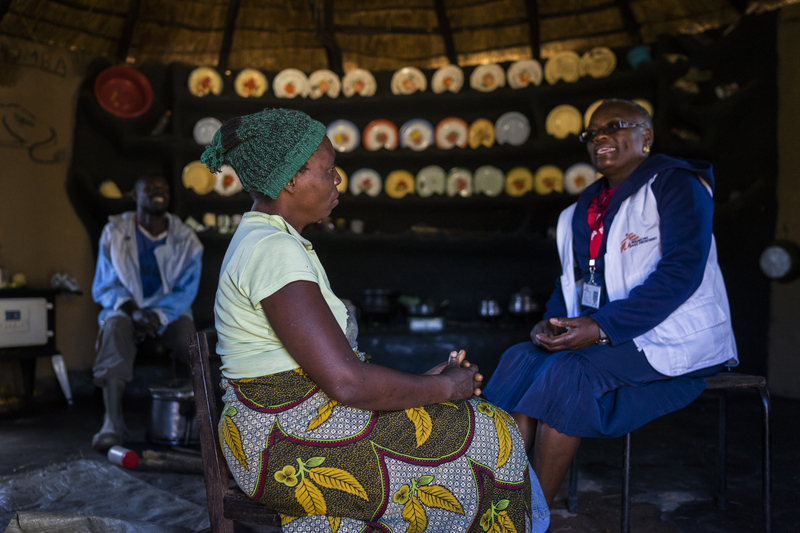 A patient consults with a member of the MSF team in Zimbabwe. Cervical cancer rates are on the rise worldwide, but the brunt of the burden falls on low- and middle-income countries, where more than 80 percent of cases occur and many women have little or no access to health services for prevention, curative treatment, or palliative care. In Zimbabwe, cervical cancer is the leading cause of cancer-related death—each year, an estimated 1,451 women die from the disease and 2,270 are newly diagnosed. In Masvingo, a rural province in southeastern Zimbabwe, Doctors Without Borders/Médecins Sans Frontières (MSF) works with the health ministry to provide a range of simple but effective cervical cancer prevention strategies. In many developing countries, including Zimbabwe, the few available radiography and laboratory services are situated in the larger cities. Without health insurance, the huge costs of biopsies, surgery, and treatment mean that many women—especially in rural areas—cannot afford or do not have access to diagnosis and treatment and are left to die from this preventable disease. This makes early screening and prevention of cervical cancer vital. In February 2016, 58-year-old Magaret Muza was surprised to learn from MSF outreach teams that she was still at risk of cervical cancer. As her eldest daughter had died of the disease, Magaret decided to go for a screening at Chimombe Rural Hospital—one of six health centers now offering cervical cancer prevention services in Gutu District, Masvingo Province. On the day of her appointment, Magaret walked for two hours along the dusty gravel track to the hospital. Once she was lying comfortably on the bed in the screening room, the nurse explained the simple process—visual inspection with acetic acid (VIA), which involves applying diluted acetic acid to the cervix while a camera projects close-up images onto a monitor nearby. Unlike a Papanicolau smear—also known as a Pap smear or Pap test—this technique gives an instant diagnosis. Within minutes, white patches around the mouth of Magaret's cervix were visible on the screen. The nurse recognized them immediately as early precancerous lesions (patches of infected cells that, if left untreated, could develop over time into aggressive cancer). At first, Magaret was frightened that she had cancer, knowing she could never afford the long, expensive treatment in the capital, Harare. But the nurse explained she would simply need cryotherapy—a five minute treatment that uses liquid nitrous oxide to freeze the lesions and stop them developing further. The procedure is painless and heals quickly. Magaret was even able to walk home afterwards. Magaret is one of many women in sub-Saharan Africa who face a heightened risk of dying from cervical cancer. Here the chances of being diagnosed and treated for cancer are extremely slim, unlike in developed countries that have well-funded, sophisticated cancer screening and treatment programs. "Cervical cancer is a very dehumanizing cancer," says Severine Caluwaerts, MSF obstetrician-gynecologist. "You might bleed a lot, you might become incontinent or be in great pain. For an emergency organization, this program might seem unusual, but it’s tragic that we are losing women to preventable diseases like cervical cancer when such effective treatments now exist." In January 2016, after feeling weak and experiencing bleeding, 54-year-old Florence Munyaradzi visited the Gutu Rural Hospital. She was then referred to another hospital several hours away for a biopsy, but could not afford the procedure, so people in her village lent her the money. She was eventually diagnosed with cervical cancer and was told she needed surgery, but Florence was too weak to work and could not afford the surgery. In July 2016, she visited the MSF clinic and, recognizing how progressed the cancer was, MSF paid for Florence's surgery—a hysterectomy. Unfortunately, in January 2017, Florence was admitted to hospital with terminal cancer. She died on January 18, 2017. Her husband, Selestino, now volunteers with MSF to raise awareness of cervical cancer in the local community. Women like Florence and Magaret are the reason that MSF now supports the health ministry in rural Gutu District, offering cancer screenings and on-the-spot cryotherapy. Since the program began in 2015, MSF has screened more than 6,500 women, 558 of whom needed cryotherapy. MSF refers women with more severe lesions to the capital, Harare, for Loop Electrosurgical Excision Procedure (LEEP), and covers all transport and medical costs. MSF nurses Sister Tendai Chigura and Sister Mercy Mandizvo have trained three more nurses and one clinical officer to conduct screenings and perform cryotherapy at the clinics. "We believe that screening and treating should be done in one visit if a women agrees, and the majority do," says Chigura. "MSF wants to eventually see these preventive screenings brought into all HIV and family planning programs for women." "There are a lot of misperceptions about cervical cancer," says Mandizvo. "Sometimes, women are ashamed because it is sexually transmitted. The link with HIV also means there is stigma." Both Chigura and Mandizvo maintain close contact with women diagnosed with more serious forms of cancer who need to be referred for treatment in the capital. While thousands of women in rural Zimbabwe now have access to the screening and treatment of precancerous lesions, the best way of stopping the disease from developing in the first place is to vaccinate girls against HPV before they are exposed to the virus. In 2017, MSF plans to support the health ministry to vaccinate more than 10,000 girls between the ages 9 and 14 in Gutu District. Since 2014, MSF has worked with the Zimbabwean health ministry to provide a range of cervical cancer prevention strategies at district and primary health care level within existing reproductive and HIV health packages. Today, in Epworth Polyclinic in Harare, women living with HIV are provided with VIA screenings, cryotherapy, and LEEP procedures. In 2016, 2,305 women were screened and 353 cryotherapy and 131 LEEP procedures were provided. In Gutu Province, MSF supports the provision of VIA screenings and cryotherapy in five centers for all women of child-bearing age. MSF also works with national health ministries to provide screenings, early treatment, and referrals in Kenya, Malawi, the Philippines, and Swaziland. MSF has also supported HPV vaccination campaigns for schoolgirls in South Africa in 2015, and in areas of Manila, the Philippines, in 2017. MSF will vaccinate over 10,000 girls between 9 and 14 years old in Gutu Province, Zimbabwe, in 2017. MSF only provides screening and treatment of pre-lesions of cervical cancer and is not directly involved in the treatment of invasive cancer. However, in certain situations, as in Zimbabwe, MSF assists with management of referrals, biopsies, and surgery.